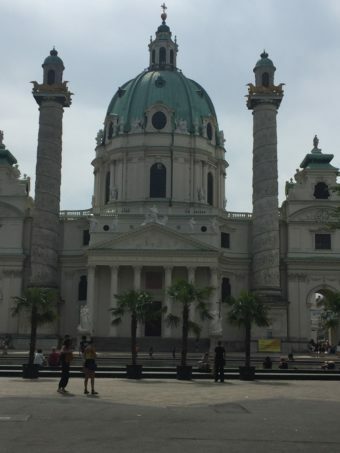 As you can see from the photo below, we couldn’t very well miss this baroque church, on the Karlsplatz not far from our hotel. The green dome of the beautiful Karlskirche, or St Charles Church is a prominent feature in the city centre and on the Vienna skyline. The church holds regular concerts in the evenings, with great acoustics and atmosphere. 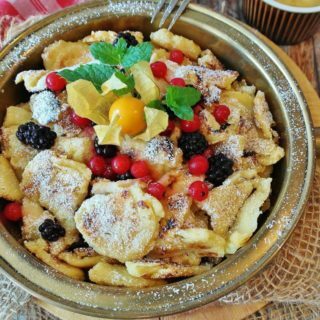 Vivaldi’s The Four Seasons was being held while we were staying in Vienna in August 2017. Tickets for the concert cost 38 euros, and 28 euros for children. The church turns out to have an extraordinary history. In 1713-14 a plague epidemic killed 8,000 people in Vienna. When it ended Emperor Charles VI vowed to build a great church to honour St Charles Borromeo, the patron saint of plague sufferers. On the portico at the front of the church there’s a massive carving showing dead people being carried away and the survivors begging for an end to the plague. 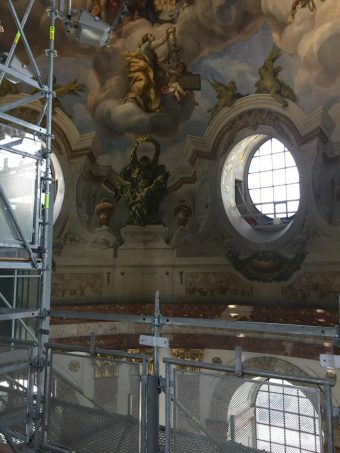 Construction of the church took 20 years and even remote parts of the Hapsburg Empire were instructed to contribute by sending building materials and money. When we arrived in front of the church we were surprised to find a patchwork of building styles from different periods and cultures. There’s the portico which resembles a Greco-Roman temple and the tower rooftops like Asian pagodas. Then there’s the baroque dome 74 metres high, and the huge columns and towers in the style of Byzantine and Ottoman architecture. All these combined were intended to glorify the emperor, endorse Vienna as the capital of a world empire and give thanks for Vienna’s deliverance from the plague. When you enter the church (for an entrance fee) you receive an information booklet explaining the art and design inside the church. I was amazed by the huge marble pillars and ornate white and gold décor. Some of the greatest painters of that time created the works of art in the six side chapels. 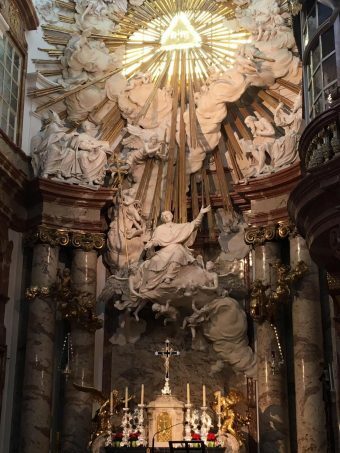 Well, the climb was a bit too scary for me so I opted to sit and admire the magnificent high altar instead of going up in the lift with them. On the right hand side just before the altar is the first floor window where the emperor used to sit when attending mass. At the high altar are the most impressive decorative columns of the whole church. 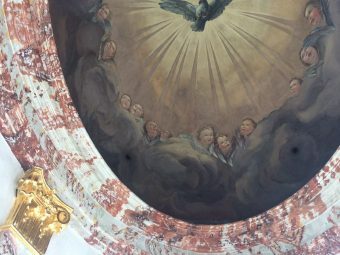 A feeling of a “pull towards heaven” is created with the carving of St Charles in his cardinal’s hat, rising towards heaven, and above him a huge wreath of clouds. God’s light is breaking through the clouds and the dazzling centre of this light bears the name of God in Hebrew script. The light is of course streaming in through a window and is much brighter than it looks on the photo. So you see, even if you don’t like heights, you’ll still find enough works of art to admire from the base of the Karlskirche. 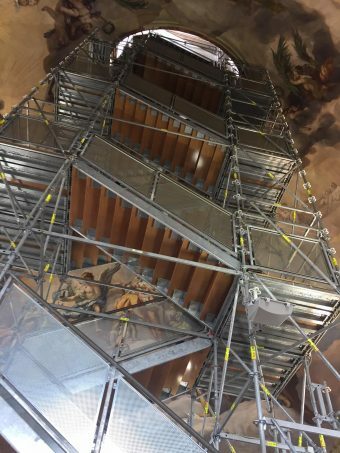 If you can manage the 70 metre trip up to the top of the dome you’ll be rewarded with a unique close-up of 18th century paintings. Awe-inspiring. It’s hard enough just painting your bedroom ceiling, and that’s only in one colour.